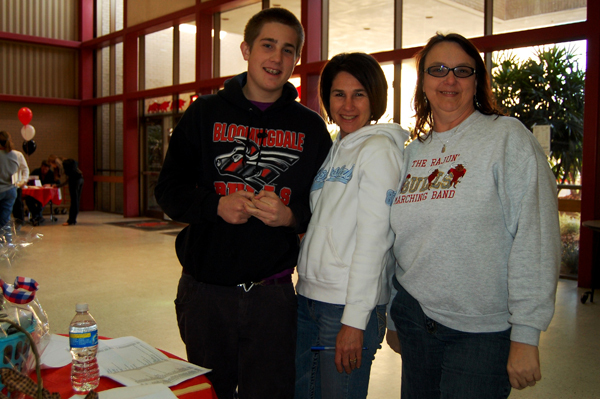 Michael Tutko is pictured with his mom, Tami, who is co-chairing this year’s 21st annual Bloomingdale Band Auction along with Starlene Banks (r). What could be better than spending a Saturday afternoon shopping for gift certificates, gift baskets, useful items and maybe a find that you just need to have? Where can you do this and not feel bad about spending the money because you know that all the monies raised through your purchases will benefit a worthy organization? The Bloomingdale Band will hold its 21st annual Benefit Auction on Saturday, March 5 in the Bloomingdale High School auditorium, 1700 E. Bloomingdale Ave., Valrico. Item preview will begin at 2 p.m. and the actual auction will begin at 3 p.m., an earlier start than in previous years. Everyone is welcome. Some of the items include various restaurant gift certificates, Busch Gardens tickets, Rays and Lightning tickets, golfing at local courses, along with Vera Bradley items. Food and drink will be available at no cost (donation suggested). There will also be a 50/50 raffle, and some silent auction items. The auctioneer is Evan Minck. The auction is the band’s largest fundraiser each year, and supports the band program in many ways. It helps to offset instrument repair costs as well as the purchase of new instruments. A portion of the proceeds will also help participating students offset their expenses for the upcoming annual music department spring trip; this year, to Orlando’s Islands of Adventure. Last year’s auction was very successful. About $9,000 was raised, and part of those proceeds benefited the students who went to London at the end of last year to perform in the 2011 New Year’s Parade. For more information, e-mail starjoybanks@yahoo.com or tamitutko@tampabay.rr.com, or call the school at 744-8018 and ask for Jon Sever, Band Director.